Balancing, soothing and comforting Vanilla oil has a beautiful warm and creamy aroma that is typical of freshly picked vanilla pods, directly from the vine. 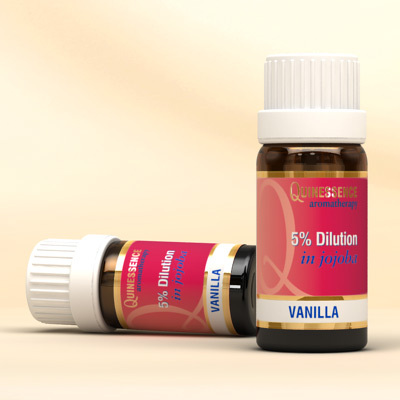 The absolute which is extracted from vanilla pods can be difficult to work with unless you have had the necessary training, so this 5% Dilution means that you can enjoy all of the benefits of this great oil without the hassle! Vanilla brings a welcome comforting effect when you are feeling stressed or hassled with the pressures of life. When it is used in vaporizers or massage treatments it helps to bring a sense of peace and balance to the modern hectic lifestyles we are all subjected to these days. This soothing and comforting oil helps to relax and clear frustration, irritability and feelings of anger. It can also help to balance roller-coaster emotions. Vanilla oil has a warm and calming aroma with almost universal appeal that is appreciated by both adults and children alike. Vanilla absolute is used for its classic aroma as a vital fragrance component in many good-quality perfumes, particularly in the oriental type of creations since it is believed to be an aphrodisiac. Vanilla 5% Dilution can be used on its own, or added to any blend to bring warmth and body, with a sweet overtone that rounds out the overall fragrance.